Chambersburg is a borough in the South Central region of Pennsylvania , United States . It is miles north of Maryland and the Mason-Dixon line and southwest of Harrisburg in the Cumberland Valley, which is part of the Great Appalachian Valley. Chambersburg is the county seat of Franklin County . The United States Census Bureau estimates the population within the borough limits as of July 1, 2008, as 18,302. When combined with the surrounding Greene , Hamilton , and Guilford Townships the population of Greater Chambersburg is 52,273. Chambersburg is at the core of the Chambersburg Micropolitan Statistical Area which includes surrounding Franklin County. The population of the Chambersburg Micropolitan Area in 2008 was 143,495. Chambersburg's settlement began in 1730 when water mills were built at the confluence of Conococheague Creek and Falling Spring Creek that now run through the center of the town. Its history includes episodes related to the French and Indian War, the Whiskey Rebellion, John Brown's raid on Harpers Ferry , and the American Civil War. The borough was the only major northern community burnt down by Confederate forces during the war. Chambersburg is located along the Lincoln Highway, U.S. 30, between McConnellsburg and Gettysburg, Pennsylvania and along U.S. 11, the Molly Pitcher Highway, between Shippensburg, Pennsylvania and Hagerstown, Maryland . Interstate 81 skirts the borough to its west. Native Americans living or hunting in the area during the 18th century included the Iroquois, Lenape and Shawnee. "Falling Spring" was first settled by Benjamin Chambers, a Scots-Irish immigrant, in 1730, who started a grist mill and saw mill by a then-26 foot high waterfall where Falling Spring Creek joined Conococheague Creek . The creek provided power to the mills, and the settlement was known as "Falling Spring." On March 30 1734, Chambers was issued a "Blunston license" for 400 acres, from a representative of the Penn family, but European settlement in the area was of questionable legality until the treaty ending the French and Indian War, because not all Indian tribes with land claims had signed treaties. The Penn family encouraged settlement in the area in order to strengthen its case in a border dispute with the Maryland Colony, which had resulted in hostilities known as Cresap's War. This dispute was not settled until 1767 and the surveying of the border known as the Mason-Dixon line . Chambers traveled to England to testify in support of Penn's claims. To maintain peace with the Indians, European settlers were sometimes removed from the nearby area. In May 1750, Benjamin Chambers participated in removing settlers from nearby Burnt Cabins , which took its name from the incident. The area was officially part of Chester County, then Lancaster, and then Cumberland until it became part of the newly established Franklin County in 1784. The Great Wagon Road connecting Philadelphia with the Shenandoah Valley passed nearby. In 1744, it was completed through Harris's Ferry , Carlisle , Shippensburg , and Chambersburg to the Potomac River. In 1748 a local militia was formed for protection against Indians, with Benjamin Chambers being named colonel. Chambersburg was on the frontier during the French and Indian War. The area's population dropped from about 3,000 in 1755 at the start of the war to about 300, with most settlers not returning until after 1764 when the peace treaty was signed. Benjamin Chambers built a private stone fort during the war, which was equipped with two 4 pounder cannons and fighting occurred nearby. Because Chambers's fort was otherwise lightly defended, the authorities attempted to remove the cannons to prevent them from being captured by Indians and used against other forts. The attempted removal was unsuccessful, and one of the cannons was used to celebrate Independence Day in 1840. The Forbes Road and other trails going to Fort Pitt passed nearby as well. The Forbes Road developed into part of the main road connecting Pittsburg and Philadelphia, and much later into US 30, and Chambersburg developed as a transportation hub at the crossroads of Forbes Road and the Great Wagon Road. Fighting continued in the area after the war, most notably the Enoch Brown school massacre during Pontiac's Rebellion and the Black Boys rebellion against British troops at Fort Loudon . The first settlers were Scots-Irish Presbyterians and German Protestants came soon afterward. Quakers and English Protestants, who made up a large proportion of early Pennsylvania settlers, did not often move as far west as Chambersburg. Blacks lived in Chambersburg almost from the start of settlement. Benjamin Chambers owned a black female slave sometime before the French and Indian War and twenty slaves were recorded as taxable property in 1786. The earliest church was established by Scots-Irish Presbyterians in 1734. Chambers gave land to the congregation in 1768, requiring only a single rose as annual rent. Later land was given to the First Lutheran Church (1780) and Zion Reformed Church (organized in 1780) under the same agreement, and these churches came to be known as the "Rose Rent Churches." A Catholic community organized in 1785. The Jewish cemetery dates back to 1840. The Mt. Moriah First African Baptist Church dates to 1887. In June 1775, soon after the Battle of Lexington , local troops were raised to fight the British in the American Revolution under the command of Benjamin Chambers's eldest son Captain James Chambers, as part of the 1st Pennsylvania Regiment. These troops were among the first non-New Englanders to join the siege of Boston , arriving on August 7, 1775. James Chambers fought for seven years during the revolution, reaching the rank of Colonel of Continental troops on September 26, 1776. His two brothers, William and Benjamin, Jr., each served for much of the war and reached the rank of Captain. James Chambers commanded local troops at the Battle of Long Island, and at White Plains, Trenton, Princeton , Brandywine , Germantown and Monmouth. He was part of the rear guard covering the retreat from Brooklyn, and was wounded at the Battle of Brandywine while facing Hessian troops under General Knuphausen at Chadds Ford . During the Whiskey Rebellion, local citizens raised a liberty pole in support of the rebels, and to protest conscription of soldiers to put down the rebellion. Nevertheless, these citizens were censured in a town meeting and removed the pole the next day. President George Washington, while leading United States troops against the rebels, came through town on the way from Carlisle to Bedford , staying overnight on October 12, 1794. According to tradition, Washington lodged with Dr. Robert Johnson, a surgeon in the Pennsylvania line during the Revolution. This march was one of only two times that a sitting president personally commanded the military in the field. (The other was after President James Madison fled the British occupation of Washington, D.C. during the War of 1812.) After sending the troops toward Pittsburgh from Bedford under General Henry "Light Horse Harry" Lee, Washington returned through Chambersburg sometime between October 21-26. James Chambers was appointed a Brigadier General of Militia during the Whiskey Rebellion. Chambersburg was incorporated on March 21, 1803, and declared the County Seat when the State Assembly established a formal government. The first courthouse was John Jack's tavern on the Diamond (town square) in 1784, with a permanent courthouse built in 1793, and the first county jail built 1795. The "Old Jail" was built in 1818, survived the fire of 1864 and is the oldest jail building in Pennsylvania. It was originally used as the sheriff's residence and had the longest continuous use of any jail in the state, operating until 1971. Today the Old Jail is a museum and home to the Franklin County - Kittochtinny Historical Society. The county's gallows still stand in the jail's courtyard. Much of the town's growth was due to its position as a transportation center, first as the starting point on the Forbes Road to Pittsburgh. The U.S. Congress placed Chambersburg on the Philadelphia-Pittsburgh postal road in 1803. The road was rebuilt as the Chambersburg-Bedford Turnpike in 1811. The Cumberland Valley Railroad was built in 1837 and was the area's center of economic activity for nearly 100 years. Until the completion of the Pennsylvania Railroad's mainline in 1857, the fastest route from Pittsburgh to Philadelphia was by stagecoach from Pittsburgh to Chambersburg, and then by train to Philadelphia. By 1859, Chambersburg was a stop on the Underground Railroad. John Brown stayed in an upstairs room at Mary Ritner's boarding house between June and October, 1859 while preparing for his raid on Harpers Ferry . Several of his fellow raiders stayed in the house as well, and four of them escaped capture and briefly visited the house after the raid. The house still stands at 225 East King Street. While in Chambersburg Brown posed as Dr. Isaac Smith, an iron mine developer, and bought and stored weapons under the guise of mining equipment. Brown (using the name John Smith) and John Henry Kagi met with Frederick Douglass and Shields Green at an abandoned quarry outside of town to discuss the raid on August 19. According to Douglass's account, Brown described the planned raid in detail and Douglass advised him against it. Douglass also provided $10 from a supporter, and had helped Green - a future raider - locate Brown. During the American Civil War on October 10, 1862, Confederate Maj. Gen. J.E.B. Stuart, with 1800 cavalrymen, raided Chambersburg, destroying $250,000 of railroad property and taking 500 guns, hundreds of horses, and at least "eight young colored men and boys." They failed, however, to accomplish one of the main targets of the raid: to burn the railroad bridge across the Conococheague Creek at Scotland, five miles north of town. During the early days of the 1863 Gettysburg Campaign, a Virginia cavalry brigade under Brig. Gen. Albert G. Jenkins occupied the town and burned several warehouses and Cumberland Valley Railroad structures and the bridge at Scotland. From June 24-28, 1863, much of the Army of Northern Virginia passed through Chambersburg en route to Carlisle and Gettysburg , and Robert E. Lee established his headquarters at a nearby farm. The following year, Chambersburg was invaded for a third time, as cavalry dispatched from the Shenandoah Valley by Jubal Early arrived. 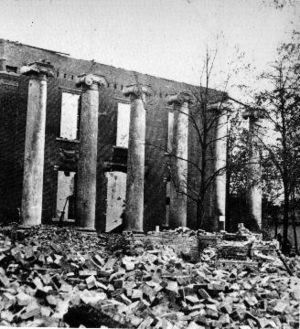 On July 30, 1864, a large portion of the town was burned down under orders from Brig. Gen. John McCausland for failing to provide a ransom of $500,000 in US currency, or $100,000 in gold.Among the few buildings left standing was the Masonic Temple, which had been guarded under orders by a Confederate mason. Norland, the home of Republican politician and editor Alexander McClure, was burned even though it was well North of the main fire. Memorial Fountain, built in the center of the diamond to honor the Civil War soldiers, was dedicated on July 17, 1878 with fifteen thousand people in attendance. A statue of a Union soldier stands next to the fountain facing south to guard against the return of southern raiders. "Fountain, Memorial Square, Chambersburg, Pa."
"Wilson's College for Girls Main Bldg. Colorized photographs taken from a series of 22 postcard views mailed in 1921.Image:Diamondviewfolder11.gif‎ | Birds eye view of the borough.Image:Diamondviewfolder1.gif‎ | City HallImage:Diamondviewfolder3.gif‎ | King Street Bridge.Image:Diamondviewfolder20.gif‎ | View of the "Lincoln Way Arch" on the Diamond. Map of Franklin County, Pennsylvania. Chambersburg is located at (39.934813, -77.656352). According to the United States Census Bureau, the borough has a total area of , all land. The elevation is above sea level. Chambersburg is located in a valley next to the Appalachian Mountains. It also sits right outside of Caledonia State Park , a park with fishing and hunting areas and hiking trails, including a section of the Appalachian Trail. Also outside of Chambersburg is Michaux State Forest, a forest. Both of theses places provide recreation for residents. Conococheague Creek , a noted trout stream, runs through the center of town. It is a tributary of the Potomac River. The northernmost reach of the Potomac watershed is a few miles north of town. Chambersburg has a cold climate, according to the United States Department of Energy. The area receives anywhere from 38 to of precipitation per year. The average January low is and the average high is . The average July high is and the average low is . As of the census of 2000, there were 17,862 people, 7,722 households, and 4,386 families residing in the borough. The population density was 2,601.3 people per square mile (1,003.9/km2). There were 8,305 housing units at an average density of 1,209.5/sq mi (466.8/km2). The racial makeup of the borough was 86.43% White, 7.56% African American, 0.18% Native American, 0.87% Asian, 0.05% Pacific Islander, 3.08% from other races, and 1.83% from two or more races. Hispanic or Latino of any race were 6.38% of the population. There were 7,722 households out of which 24.1% had children under the age of 18 living with them, 41.2% were married couples living together, 11.7% had a female householder with no husband present, and 43.2% were non-families. 37.5% of all households were made up of individuals and 16.8% had someone living alone who was 65 years of age or older. The average household size was 2.16 and the average family size was 2.83. In the borough the population was spread out with 20.8% under the age of 18, 9.1% from 18 to 24, 26.8% from 25 to 44, 20.6% from 45 to 64, and 22.7% who were 65 years of age or older. The median age was 40 years. For every 100 females there were 81.7 males. For every 100 females age 18 and over, there were 77.1 males. The population stood at 7,863 in 1890; 8,864 in 1900; 11,800 in 1910; 13,171 in 1920; and 14,852 in 1940. It was estimated to be around 18,000 people in January of 2008. The surrounding area has a large farming population, including many Amish and Mennonite families. Franklin County's largest crop is maize (corn), with 579 farms that cover of land. Franklin also has 344 wheat farms and 299 barley farms which combined cover . Manufacturing in Chambersburg includes machinery production, metal fabrication, and food processing. According to the 1997 Economic Census of Franklin County. The largest sectors by payroll were manufacturing companies such as T B Wood's Inc., Manitowoc cranes, retail trade, and health care and social assistance. The economy of the area is still largely based on agriculture. Retail stores such as Wal-Mart and Lowe's serve the population with jobs and basic needs. The Chambersburg Mall , which houses four anchor stores plus about fifty smaller stores, is located in the unincorporated village of Scotland, about four miles (6 km) north of town on Interstate 81. The retail sector has grown very quickly since 2006 with the opening of stores such as Target, Circuit City, Petsmart, Michaels, and Kohls near the newly built Exit 17 of Interstate 81. Several restaurants new to the region have opened including Starbucks (2), TGI Fridays, Red Robin, Fuddruckers, Moe's Southwest Grill, Ruby Tuesday and Panera Bread. The city's location on Interstate 81 within of both Washington, D.C. and Baltimore, Maryland encourages trucking and distribution businesses. The Letterkenny Army Depot five miles (8 km) north of town is a major employer. Camp David also employs Chambersburg residents. In 2004 Chambersburg had a per capita personal income (PCPI) of $28,208, below the national average of $33,050. Chambersburg is part of small town America. Recreation includes hunting, and sports events such as high school football games, and baseball games at Henninger Field . The town also hosts a minor league football team, the Chambersburg Cardinals, who play in the North American Football League People in the area speak with a Pittsburgh English or Central Pennsylvania accent, such as over pronouncing "O's" and "I's." Caledonia State Park provides an area for outdoor activities, with the park especially busy on July 4th. The Capitol Theater was opened as a movie palace on Main Street in 1927. In 2003 it reopened as the Capitol Theatre Center and serves as home to the Capitol Theatre Main Stage and Auditorium, Chambersburg Council for the Arts, Caledonia Theatre Company, Chambersburg Ballet Theatre School and Chambersburg Community Theatre. Journalist David Brooks in 2001 used Chambersburg and Franklin County to typify Republican “Red America.” According to Brooks, there is little obvious income inequality and people don’t define their place in society by their income level. They value the work ethic and are anti-union, anti-welfare, pro-free market, and religious social conservatives. The municipal government operates under the Pennsylvania Borough Code, with the Town Council holding both legislative and executive authority. The ten councilmen are elected from five wards; two from each ward with staggered four year terms. The Mayor administers the Police Department and can cast tie-breaking votes on the Council. Other departments are administered by the Borough Manager. Pete Lagiovane became Mayor on January 7, 2008. Chambersburg is part of the 9th Congressional District of Pennsylvania and represented by Bill Shuster (R) in the House of Representatives, and by Arlen Spector (D), and Bob Casey, Jr.(D) in the Senate. Wilson College is a private, Presbyterian-related, liberal arts women's college founded in 1869 and named for its first major donor, Sarah Wilson of Chambersburg. The college has 800 students and is known for its Women With Children, Veterinary Medical Technician, and Equestrian programs. Chambersburg Area Senior High School (CASHS) is a public school with around 1,800 students in grades 10-12, drawn from the borough of Chambersburg and the surrounding townships of Hamilton, Greene, Lurgan, Letterkenny and Guilford. CASHS is accredited by the Middle States Association and has occupied its current facilities since 1955. Principal Dr. Barry Purvis was recognized as the 2006 High School Principal of the Year by the Pennsylvania Association of Elementary and Secondary School Principals. The Scotland School for Veteran's Children (SSVC) is a state owned school that offers tuition-free residential education programs for children of Pennsylvania residents who are veterans or are currently serving in the U.S. armed forces. It is located about four miles (6 km) north of Chambersburg in the unincorporated village of Scotland and has about 300 students in grades 3-12. The school was established in 1895 as the Pennsylvania Soldiers Orphans Industrial School. Over 10,000 students have been educated at the school. The campus contains about 70 buildings including residential cottages. J. Frank Faust Junior High School is the only public junior high school for eighth and ninth grade students of the Chambersburg Area School District. It serves about 1400 students. Chambersburg Area Middle School (CAMS) is the only public school for sixth and seventh grade students in the Chambersburg Area School District. During the 2001-02 school year, CAMS was recognized with the Blue Ribbon School Award of Excellence by the United States Department of Education, the highest award an American school can receive. Private schools include Corpus Christi, a Catholic school with 310 students and over 20 teachers, and Cumberland Valley Christian School, a private Christian kindergarten through twelfth grade academy located in Chambersburg. Cumberland Valley Christian School is affiliated with the Open Door Church and has approximately four hundred students. Other private schools include the Montessori Academy of Chambersburg (22 months-8th grade, non-denominational) and Shalom Christian Academy (K-12, Mennonite affiliation), and several elementary schools with Mennonite, Baptist, Brethren, Christian Science, and other religious orientations. Coyle Free Library has roots going back to 1891 when a library of 166 books was organized by the local Afternoon Club. A member of the club, Blanche Coyle, left of bequest of $30,435 in 1915 to construct a library building. The building was completed in 1924, located at the corner of Second and Queen Streets. Later the library was made part of the Franklin County Library and began to receive funds from the County and State, though the Afternoon Club still donated funds though at least 1979. The building currently occupied is a former post office. The Chambersburg Public Opinion is the only daily newspaper published in town, and has weekday circulation about 17,000. It was founded in 1869 and is now owned in partnership by Gannett and MediaNews Group. Television reception can be poor because of the surrounding mountains. WJAL , a family oriented station broadcasts from Chambersburg, and Harrisburg PBS station WITF-TV rebroadcasts via low-powered translator W38AN. Franklin County is included in Harrisburg DMA. All Harrisburg TV stations are available off air and on cable. WHTM is the first network affiliated television station to establish a bureau in Chambersburg. WHAG-TV , WWPB, and WWPX , broadcast from nearby Hagerstown, Maryland . Chambersburg shares a radio market, the 166th largest in the United States, with Waynesboro, Pennsylvania and Hagerstown, Maryland . Philip Berlin, inventor of the first railroad sleeping car. Revolutionary War soldier Margaret Corbin, known as "Captain Molly." Abolistionist publisher Martin Delany, who in 1865 became the first African-American field officer in the U.S. Army, was educated in Chambersburg in the 1830s. Gus Dorner Major League Baseball pitcher (1902-1909). Henry Burchard Fine (1858-1928) was a dean at Princeton University and mathematician. Baseball Hall of Famer Nellie Fox was born and lived just west of town in St. Thomas Township . Patrick Gass (1771-1870), the last surviving member of the Lewis and Clark expedition was born just outside Chambersburg (Falling Spring). The Rev. John Grier Hibben, later President of Princeton University , served as pastor of Falling Spring Presbyterian Church, 1888-1891. Stephen D. Houston a renowned Mayanist scholar, epigrapher and anthropologist was born in Chambersburg in 1958. Archbishop John Hughes lived in Chambersburg between 1817 to 1819 before going on to Mount St. Mary's University his family are buried at the Corpus Christi Church Cemetery in Chambersburg. Alexander McClure, editor of the Franklin Repository from 1852-1864. David Fullerton Robison, a U.S. Representative, who in 1859 died of National Hotel disease. Charena Swann wife of Lynn Swann. Joseph Winters an African-American inventor and abolitionist, moved to Chambersburg in 1830. Sarah Wilson the namesake and first major donor of Wilson College , 1869, a private women's college. Journalist and author Gwen Ifill spent a portion of her childhood in Chambersburg, while her father pastored St. James A.M.E. Church. Table 4: Annual Estimates of the Population for Incorporated Places in Pennsylvania, Listed Alphabetically: April 1, 2000 to July 1, 2008, U.S. Census Bureau, 2009. Retrieved 1 July 2009. Table 1: Annual Estimates of the Resident Population for Counties of Pennsylvania: April 1, 2000 to July 1, 2008, U.S. Census Bureau, 2009. Retrieved 1 July 2009. CIBA cited as one of the best by Education Department, Journal Inquirer, November 16, 2006. "The Blue Ribbon award is given only to schools that reach the top 10 percent of their state's testing scores over several years or show significant gains in student achievement. It is considered the highest honor a school can achieve." Viers Mill School Wins Blue Ribbon; School Scored High on Statewide Test; The Washington Post. September 29, 2005 '"For their accomplishments, all three schools this month earned the status of Blue Ribbon School, the highest honor the U.S. Education Department can bestow upon a school." Private Schools in Chambersburg PA accessed March 24, 2007. Manuscript from the Coyle Free Library, Our Library Roots and Branches, Jane K. Schleicher, Librarian, November 7, 1979 accessed March 25, 2007. Market Ranks and Schedules 151-200, Arbitron, Fall 2007, Retrieved 22 March 2008.